Their Tara model is a virtually indestructible Front Rack made from thin walled 25CrMo4 steel tubes. 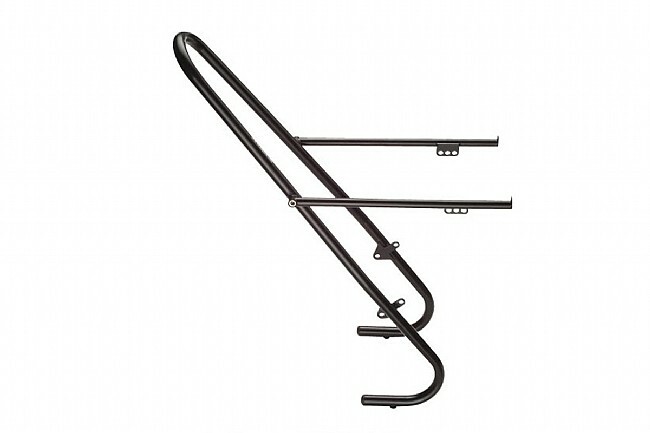 By lowering placement of weight on the front-end of your bike, Lowrider-style racks ensure more predictable steering and dramatically improved handling compared to other front carriers. The Tara Lowrider also features adjustable side arms and three different mounting holes so it can be easily mounted on nearly every fork*. It even has a separate set of lower eyelets for more convenient fender attachment. Pair with the Cargo Rear Rack for the ultimate bombproof touring set-up. The load capacity for the Tara rack is 33 lbs (15kg). Weight: 530g with included hardware. Black. *The Tara can only be mounted to forks with both mid-blade eyelets and fork-tip eyelets. Tubus also produces a mounting set for forks which are not equipped with mid-blade eyelets. If you are unclear about compatibility with your fork please contact us. I mounted successfully a Tubus Tara rack on my 2017 CO-OP ADV 2.1 equipped with stock mechanical disc brakes, 700c x 35m Schwalbe Marathon tires mounted on Deore hubbed wheels, and PlanetBike 45m Cascadia fenders. I hang Ortlieb Gravel Pack panniers on the Tara. I am perfectly satisfied with the appearance and utility of the Tara in this configuration. The fork on the ADV 2.1 is wide and the fork blades are chubby. The Tara just barely fit, attaching the Tara by the the upper of the two eyelets. The Taras horizontal pannier mounting bar is almost level. The Gravel Pack panniers fit snugly, using both stock horizontal clips and one stock vertical clip on each pannier. (The angle of Taras vertical mounting bar does not provide enough access to attach both stock vertical clips on a Gravel Pack pannier. I had to slide out of the way the second vertical clip of each pannier.) Also, I had to replace my Deore quick release skewer with a slimmer after-market skewer in order to rotate conveniently the skewer quick release handle when the Tara is mounted. Further, in order to remove the front wheel when the Tara is mounted, I must first remove the skewer - which means I have to re-mount the front wheel on the fork without the skewer, then slide in and tighten the skewer. I am willing to tolerate this inconvience because I value the appearance, sturdiness and lightweight of the Tara, compared to all competing front racks I have observed. As shipped from BTD, my copy of the Tubus Tara arrived when expected in mint condition, and with all mounting hardware listed on the manifest, except for the spanner wrench. Overall, am very pleased with my purchase. I have been purchasing bicycle tires and accessories from BTD for almost a decade with confidence and satisfaction. I recommend BTD to friends and associates enthusiastically.